Friday, May 15, 8 p.m. When your band's frontman is known for a level of onstage chaos that can involve what some might label "antics"—perhaps most famously, running into startled audiences while swinging a hammer—your reputation can precede you. 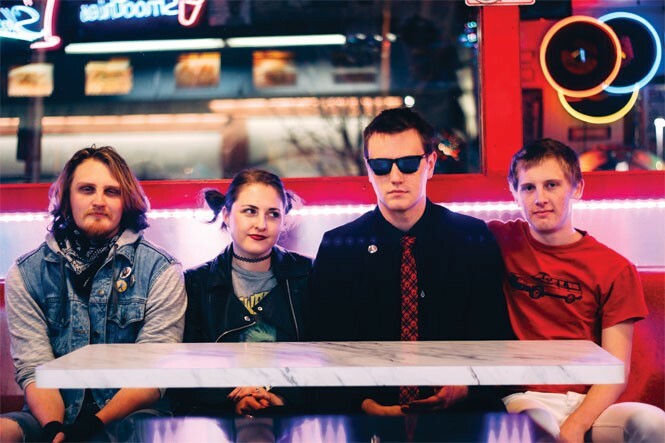 But lead vocalist and musical force-of-nature Andy Andersen (aka Max Punck) of Provo-based rock & rollers The Ladells has news for folks who may have come to think of them as "that hammer band": "I don't think you're gonna see the hammer come out ever again onstage." It's a phenomenon Andersen is all too familiar with: encountering people who, when they talk about The Ladells, say something like, they're the band with "the crazy guy that does that stuff," he says. "And that's great, I'm glad we made an impression people won't forget. But I almost feel like, 'Well, did you listen to the music as well?'" But now, with the release of The Ladells' new album, Vamp, they're proving that their actual music is equally if not more powerful than their in-your-face stage presence. "We've built this reputation of our stage shows, but people need to, and deserve to, hear how good we sound, and how great the rest of the band sounds, and how important they are to everything that's going on around here in the local music scene," Andersen says. "I just hope people are ready to listen—and if they're not, we'll have to see what we can do to make them listen anyway." Made up of brothers Andy, guitarist Olin (aka Olin A. ), drummer Karl Andersen (aka Karl Ladell) and bassist Jenna Andersen (who's also Andy's wife, and goes by Saliva Plath in the band), The Ladells' current lineup has been together for about a year. Named after the Andersens' grandfather, Ladell, the band started out by doing covers of Velvet Underground, which, along with Iggy Pop & the Stooges and David Bowie, was a band that had a lasting impact on Andy's energy and style onstage. "When I started out, I was really influenced by early-'70s art-rock style of performance and making yourself part of the art," he says. "Combining rock & roll with performance art and challenging the audience." At some of the band's notable recent shows—including The Ladells' winning performance at Muse Music Cafe's Battle of the Bands in October 2014, and their wild appearance at Best of Utah Music in February—Andy could be relied on to pull out all the stops, by showcasing onstage karate chops, crashing into Olin's drums and, of course, making some people nervous with that very real hammer. Because, for Andy, "I do what I do because I'm trying to keep up with the other three members of the band," he says. "They're so ferocious, and Olin's guitar is so ferocious, Jenna's bass is so powerful ... and Karl's drumming is so manic and amazing that I'm just kind of like, 'Well, I just have my voice and my body, so I need to do my part, too.'" But still, the eye can't help but be drawn to Andy, even though concertgoers "should be listening to the rest of the band as much as they're watching me," he says. "That's why I'm really excited about our new album. ... Because we've got something to say onstage, but we've got something to say musically as well. It's just as important to us." With Vamp, Andy wanted to find another "strong-sounding one-syllable word," similar to the title of their 2014 album, Crime. Even though Crime was technically the first album The Ladells released, Andy says they consider Vamp to be their official debut, since their lineup has changed so much since Crime came out. And what an electric, attention-grabbing debut it is. A rock/punk powerhouse with a major kick, Vamp encapsulates The Ladells' single-minded work ethic and dedication to their music. "We're really about rock & roll as a serious art form and taking what we do seriously," Andy says. Although it wasn't intentional, when he put the songs on Vamp together, Andy realized "the album, as a whole, is about the internal battle with the self," he says. "It's hard to be a human being and to live with yourself. A lot of the images in the songs are about ghosts of your own inner struggles," a theme that's especially obvious on "Doppelganger." But above all, Vamp—on songs ranging from "Velvet Wasteland" (which is the first song Andy and Olin wrote together) to new tracks like "Thin Like a Man"—simply speaks to the soul like only pure, unadulterated, cathartic rock can. In other words, The Ladells aren't relying on any gimmicks, which is what Andy's hammer might have turned into eventually. Because as a band that's driven to "shake people up," he says, sometimes they have to shake themselves up, too. "As something becomes a potential for a crutch, I feel like you have to get rid of it," Andy says. "We need to create obstacles for ourselves. Every time we're onstage, we're completely naked, and the whole thing is a total risk. That's ... the only way you keep finding truth in what you're doing and finding truth with the audience. Ultimately, that's what we're all about, is the continual, eternal search for truth. And we do that through rock & roll."